While aircraft played an important role in both the first and second World War, you can't remember any helicopters. It's true that Germany had a reconnaissance helicopter Flettner FI 282, nicknamed the Hummingbird, which was introduced in 1942 and is considered the world's first series production helicopter. But only 24 were built and they didn't play an equally important role as the famous Spitfire or the Messerschmitt. Why did it take so long before the world could fly around in helicopters? Isn't a helicopter as easy to design and fly as an aircraft? The answer is no! Even today it's more dangerous to be a helicopter pilot than it is to fly a normal plane: the helicopter accident rate is 30 percent higher than the accident rate for fixed-wing aircraft. To understand why a helicopter is more complicated than an aircraft, you have to make sure you understand how an helicopter is working. Basically, a helicopter pilot has to use three controls: collective, cyclic, and pedals - and the pilot has to use all three to stabilize the helicopter. 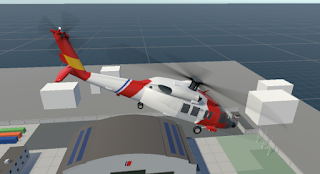 As the helicopter pilot is controlling the up/down movement of the helicopter with the collective, and as the power to the rotor is changing, the rotor will also produce more or less torque. To stop the helicopter from rotating because of this torque, a helicopter has a tail rotor. Some helicopters have two rotor blades, either on the same axis or after one another, to stop the torque, but most helicopters have a tail rotor. To control this torque, the pilot has two pedals, which will control the angle of the rotor blades attached to the tail rotor. In the same way as the angle of the main rotor blades produces more or less lift, if the angle of the tail rotor blades change, the helicopter will rotate around its axis. Leaning forward is fine at certain low speeds, but at higher speeds, you want to avoid this angle. To make a helicopter fly forward without an angle, most helicopter have a horizontal stabilizer which will help the helicopter to fly straight forward at certain speeds. Why is it difficult to fly a helicopter? 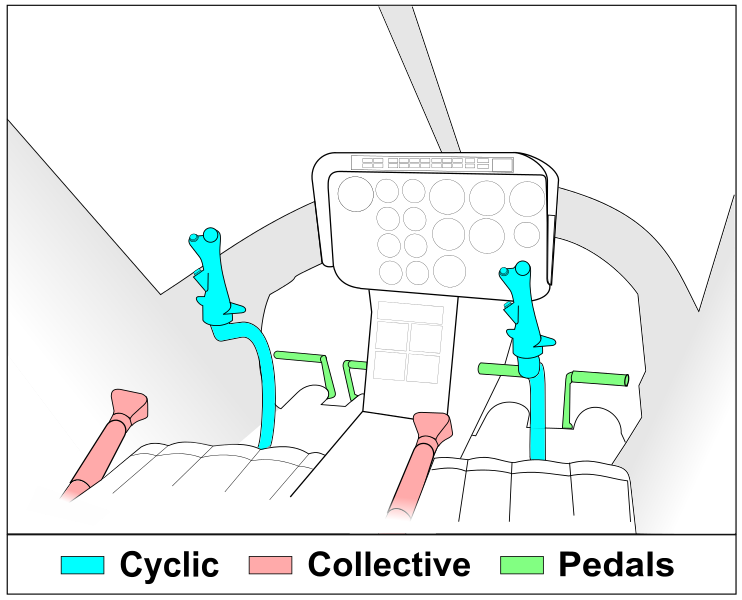 A helicopter pilot is controlling the helicopter by using the collective, cyclic, and pedals. So why is it more difficult to fly a helicopter than it is to fly an aircraft? The problem is the forces produced by the different helicopter blades. As the main rotor is rotating in different directions, the wind from the rotor blades will affect the helicopter, so to keep the helicopter in a hover position, the pilot has to make adjustments to the collective, cyclic, and pedals. It's said that a helicopter pilot has to develop a certain "feel" for the helicopter. Small deviations can be felt and seen, so corrections should be made before the helicopter actually moves. And even when flying the same model of helicopter, wind, temperature, humidity, weight, and equipment make it difficult to predict just how the helicopter will perform. "Next thing to do, now that you've got the cyclic down, is to let you try all the controls at once. Think you're up to that kid?" "I got it." The cyclic tugged, the collective pushed, and the pedals slapped my feet, but for a brief moment I was in complete control. I was three feet off the ground hovering in a real helicopter. A grin was forming on my sweaty face. Whoops. The illusion of control ended abruptly. As I concentrated on keeping us over one spot with the cyclic, we climbed. When I pushed the collective back down to correct, I noticed we were drifting backward, fast. I corrected by pushing forward. Now I noticed we were facing ninety degrees away from where we started. I corrected with the pedals. Each control fought me independently. I forgot about having to push the left pedal when I raised the collective. I forgot the cyclic-control lag. We whirled and grumbled in a variety of confusing directions, attitues and altitudes all at once. There were absolutely too many things to control. The IP [instructor], brave man that he was, let the ship lurch and roar and spin all over that field while I pushed the pedals, pumped the collective, and swept the cyclic around, with little effect. I felt like I had a handful of severed reins and a runaway team of horses heading for a cliff. I could not keep the machine anywhere near where I wanted it.